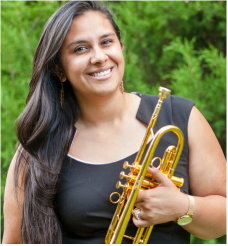 Marianela deVries is a freelance trumpet player and educator in the Dallas Forth Worth area. Originally from Costa Rica, Marianela started her musical studies at the National Music Institute of Costa Rica in 2000 and started trumpet lessons with Professor Luis Miguel Araya in 2004. In 2009, Marianela moved to the Unites States to attend Interlochen Arts Academy, a prestigious boarding Arts School in Northern Michigan, where she was a student of Kenneth Larson. Marianela received her Bachelor's degree in Music Performance at Lynn University under the tutelage of Marc Reese and is currently getting her Masters degree in Music Therapy at Texas Woman's University. Marianela has been fully involved performing nationally and internationally and has toured and performed with important musicians from around the world including, Orchestra Sinfonica Juvenil of Costa Rica and the Symphonic Bands of the Palm Beaches. ​Marianela is a passionate educator who has been actively teaching trumpet the last 8 years around the country and her native country, Costa Rica. Currently, Mrs. deVries teaches in Lewisville ISD, The Dallas School of Music and maintains a private studio. Marianela’s main focus is to create a relationship with the students to help them improve not only their musicianship skills but also to improve human connections, cognitive, motor and social skills, and more through music. Passionate about all student’s love of music, Marianela teaches from young children to adults of all ages.